On Nov 9, from 6 to 9 pm., Baterbys Art Gallery – voted as Orlando’s Best Art Gallery - will showcase 9 local artists. Proceeds from this event will support the cause of Coastal Conservation Association (CCA) Florida. Nov. 5, 2012 - PRLog -- On November 9, from 6 to 9 p.m., Baterbys Art Gallery – voted as Orlando’s Best Art Gallery - will showcase local talent and bring a splash of color to your Friday night. 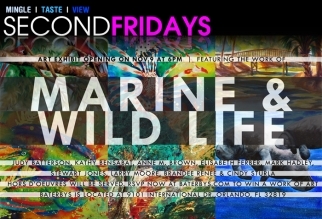 Proceeds from this event will support the cause of Coastal Conservation Association (CCA) Florida. 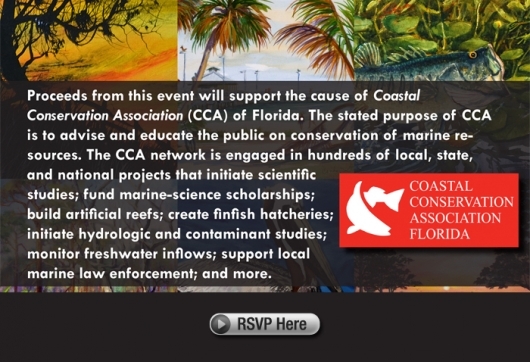 The CCA network is engaged in hundreds of local, state, and national projects that initiate scientific studies; fund marine-science scholarships; build artificial reefs; create finfish hatcheries; initiate hydrologic and contaminant studies; monitor freshwater inflows; support local marine law enforcement; and more. These nine local artists’ bodies of work focus on Marine and Wild Life themes and subject. ● Kathy Bensabat’s nationally recognized paintings center around scenery from Caribbean vacations. Her work can be seen at Ta Da Gallery in New Smyrna Beach, FL. ● Stuart Jones is a watercolor artist specializing in the diverse faces of nature. His paintings hang in numerous residences around the world and local galleries. ● Anne Marie Brown began painting in her 20’s when she was a florist in New Jersey, painting her own floral designs in watercolor. There is a metaphysical effect in Anne Marie’s work. After looking at her work, you automatically start attaching images of her art to your inventory of ideas of how a perfect, dreamlike paradise looks like. ● B. Renee, the daughter of an artist, found it to be second nature to have a paint brush in hand. Renee is inspired by nature and specializes in acrylics but loves exploring with new techniques. ● Cindy Sturla moved to Winter Springs, FL, in 1982 after living in Europe for several years. She was inspired by impressionist works and continues to specialize in watercolor art. She teaches classes at Gallery on First. ● Mark Hadley is a self-taught artist who has won multiple awards for his vibrant acrylics and black and white scratchboard illustrations. His collections can be found all around the world and on apparel and marketing pieces for notable brand name companies. ● Judy Batterson refined her painting skills while teaching art at the same time. Making the shift into the professional art world, Judy is passionate about preserving the natural environment of Florida through her paintings. ● Larry Moore is an award-winning professional illustrator. His 25 years of experience has lead to a highly succesful painting career. His goal in painting, whether in studio or outdoors, is to achieve enough honesty in the work that the painting becomes a window to a new place for the viewer, a place of rest. ● Elisabeth Ferber was exposed to a very classical art background at a very young age. She strives to create a painting that shows the beauty and character of wildlife and/or landscapes with a goal to capture scenes in the hope that others will see and appreciate the land that we have today. She was featured as the cover artist of Winter Park Magazine and is listed in the Best of America Oil Artists book. Baterbys has over 25 years of experience in the art world and auctioneering. The gallery’s art collection is comprised of thousands of 20th Century and modern contemporary artworks, including some of Florida’s most respected artists. Art exhibits, auctions and lectures take place throughout the year at the 7,000 sq.ft. gallery situated in the heard of International Drive in Orlando. To learn more about Baterbys, visit http://www.baterbys.com.